Choosing the best drives in Greece isn’t easy, as there are so many wonderful experiences, but we can at least say that we have driven over most of the Greek mainland and on many of the major islands, including Crete, so we have plenty of experience. The drive between Athens and Thessaloniki has some wonderful moments – and some awful ones too. Driving round the Pelion was also impressive. So too was... but we could go on choosing forever. The Nestos River marks the boundary between Macedonia and Thrace in north-eastern Greece, a part of the country where few foreign visitors other than the adventurous backpackers venture. It’s mainly a low-lying landscape of cotton fields and tobacco plantations, but to the north are the Rodopi Mountains that separate Greece from Bulgaria. The two major towns at either end of the valley are Drama and Xanthi. 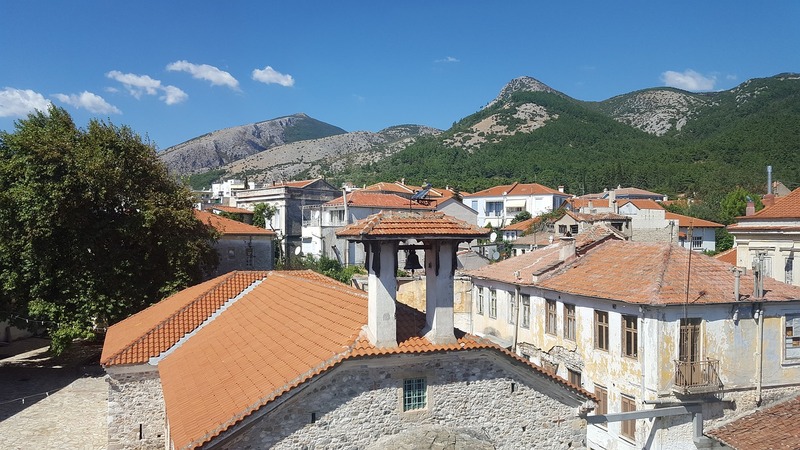 Xanthi has a delightful eastern feel to it, letting you know that Turkey isn’t too far away, and some impressive mansions that once belonged to wealthy tobacco barons are one of the town’s most attractive features. Take the road north to Stavroupoli, where the main road meets the Nestos River and heads off into the foothills of the mountains. Or, in winter, sometimes doesn’t: winter snow can block this road, so watch for the warning road signs. At any other time of year it’s a wonderful drive, partly through wooded areas, and passing by (or stopping to visit) several remote rural villages along the way. At Paranesti the road leaves the river valley (the river rises in Bulgaria), and instead heads south to run alongside the railway tracks and down into Drama – appropriately enough for this dramatic drive. On Crete the tour buses head east from Iraklion to do the circular drive around the Lasithi Plateau. It is a beautiful drive, though the sheer numbers of tour buses and other drivers can spoil it a little. If you have your own wheels head west from Iraklion, and south to the Amari Valley, a much quieter but equally beautiful part of the island, also easily accessible from Rethymnon on the north coast or the resorts of Ayia Galini and Matala in the south. From wherever you start, you can do a circular tour of the valley to get you back to base, or drive through the valley while heading from one coast to the other. Just be sure to include the town of Amari itself, the main one in the valley though no more than a large village, with a tiny main square where there’s the inevitable friendly taverna with a few rooms. Yerakari is another must-see, the centre of the cherry-growing trade in the valley. 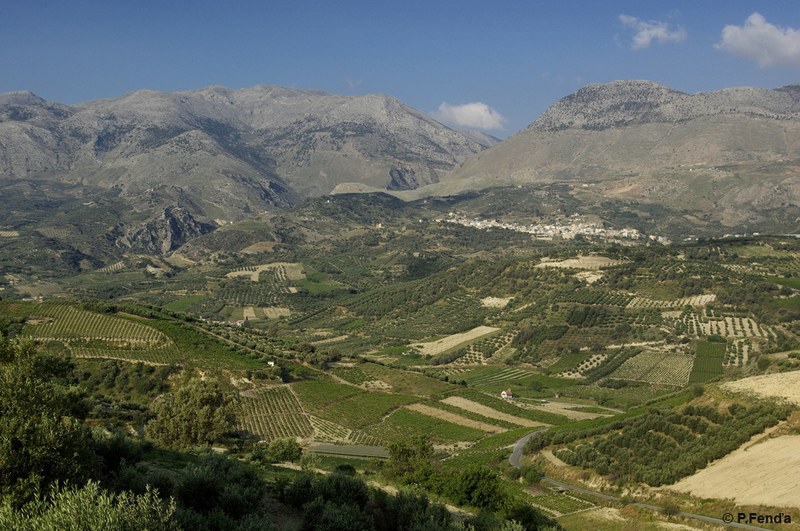 The whole of the Amari Valley is fertile and filled with orchards, olive groves and vineyards. Surrounded as it is by mountains, with the Psiloritis range to the east, it’s a fabulous place to tour and see the Crete that lies behind the tourist resorts. The region of Epirus in western Greece is one of the most stunningly beautiful in the whole country, if not the whole of Europe. There are pretty lakeside towns like Ioannina and Kastoria and the awe-inspiring Pindus Mountains. A drive east from Ioannina takes you through the mountains, over a high pass that can be closed in winter, and down into the region of Thessaly, and one of the most distinctive and magical sights in the world: the monasteries of Meteora. The capital of Epirus, Ioannina, is one of our favourite towns. It has a character all its own, sitting on the shores of a lake in the middle of which is a small island called Nissi, which means ‘the island’. You could easily spend several days in and around Ioannina, and you should drive out on the road towards the Perama Caves – well worth stopping off to explore the cave network. The road then rises around the lake to give lovely views back of Ioannina, before winding upwards into the mountains. Another essential stop is the mountain town of Metsovo, a ski resort in winter and another very distinctive Greek community. Beyond here is the Metsovon Pass, the highest in Greece at 1705m, but don’t set out on this drive in winter without checking the state of the roads. Even if the pass is open, the sharp bends and sheer drops can be dangerous for the driver unused to them. 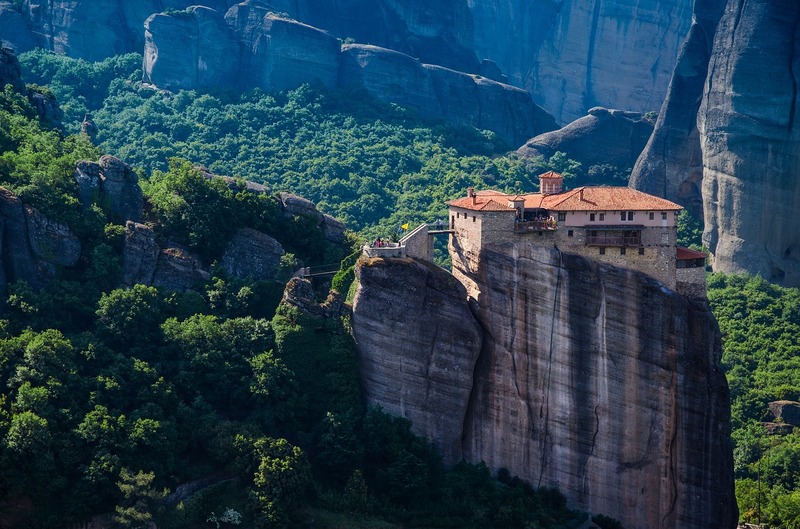 At other times the rewards are enormous, not just here in the high mountains, but the descent into the lusher plains of Thessaly and, at the very end, the amazing sight of the monasteries of Meteora sitting on top of the rock formations jutting out of the plain. This has to be one of the best drives in Greece. This is only a short drive, but one that will live long in the memory. Like Ioannina, Kastoria is a pretty lakeside town of the kind not normally associated with Greece. There are handsome mansions, one of them now a folk museum, and a wealthy history because of its fur-trading past. Head north out of the town and you climb through woods and head towards Greece’s northern frontier. Brash holiday resorts like Faliraki seem to belong to another planet. It’s only just over an hour or so until you start to descend, and round a corner you will get your first glimpse of the Prespa Lakes. The whole area here is a National Park, and there’s wildlife in abundance. There are small fishing communities on the shores of the lakes, and it is one of the most peaceful areas of Greece. A visitor centre in the main village of Ayios Germanos gives information about walks and wildlife, and you may be able to take a boat trip out onto the lakes with one of the local fishermen, if you ask around. 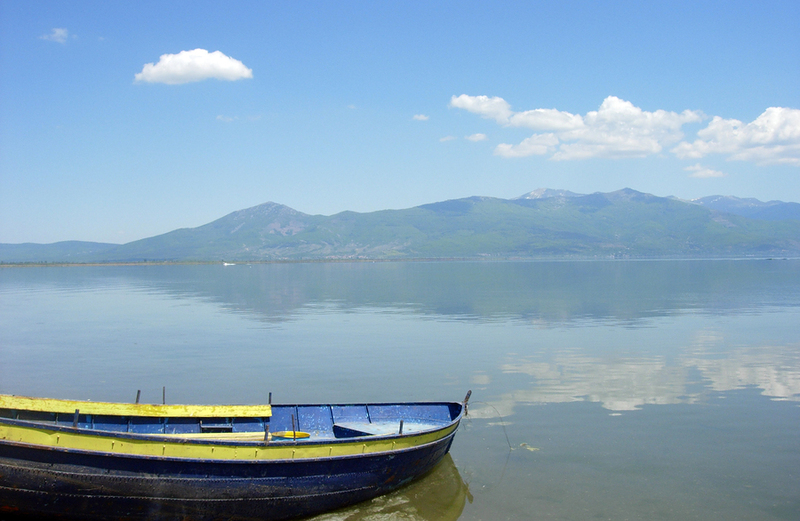 In the middle of the Great Prespa Lake is the border point where Greece meets Albania and the new country of Macedonia. You can’t get much more off the beaten track than this. The Mani is no longer the remote region it once was, and visitors have been quick to pick up on its rugged charms. To drive around the peninsula is to discover another very distinctive part of Greece, where tall, tower houses reach into the skies. These fortified houses were built to protect the families because of the feuds that went on in this wild west of a place for centuries. But don’t worry – they’ve calmed down a bit these days. The main town of the Inner Mani (the southernmost part of the peninsula) is Areopoli, so drive south from here and you will quickly come to the Diros Caves, where boats take visitors into the underground cave networks. Back on the road, the route is easy to follow as the main road is basically a circular route around the Inner Mani. One turning to watch for is in Alika, where a right turn is signposted for Vathia. 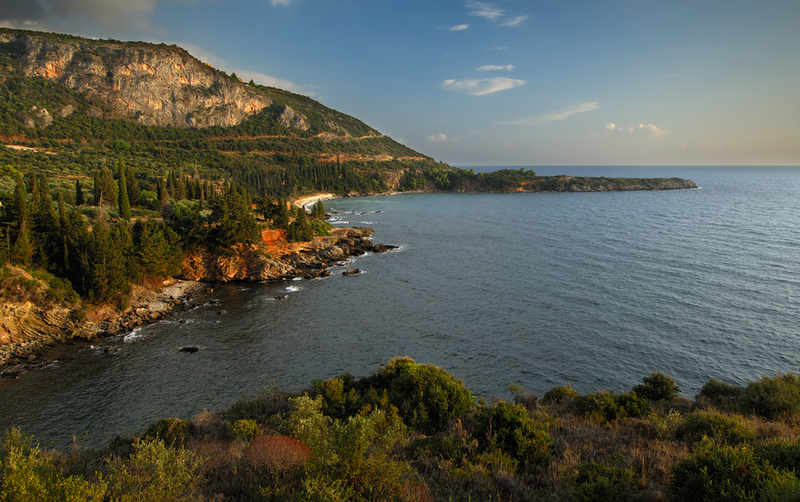 Take this diversion, as Vathia has some of the finest tower houses and you can continue on the road all the way to the end, which is Cape Matapan, the southernmost point of the Greek mainland. Return to Alika and carry on along the main road, which then heads north up the eastern coast with fabulous coastal and mountain views. There are several small villages and some quiet beaches, with views across to the eastern-most of the three peninsulas that look like fingers dangling off the Peloponnese. The road eventually heads inland and crosses the Mani, back to Areopoli. So there you have it: our best drives in Greece. For the moment, anyway, until we discover another one.